The laptop long battery life in an ultra-thin durable design for professionals on-the-go. The Acer TravelMate P614-51 sports a magnesium-aluminium alloy chassis that is stronger and lighter than standard aluminium alloys at the same thickness. Acer announced its latest addition to its iconic TravelMate P6 series, a thin, light, and durable commercial Windows 10 Pro notebook series built for professionals that travel frequently or work in the field. Robust and powerful with up to 20 hours of battery life, it’s built to withstand life on the road and support heavy workloads. The Acer TravelMate P614-51 sports a magnesium-aluminium alloy chassis that is stronger and lighter than standard aluminium alloys at the same thickness. It also gives the laptop a sleek and modern aesthetic. Weighing just 2.4 pounds (1.1 kg) and measuring only 0.6 inches (16.6 mm), it’s easy to take on the road. With up to 20 hours of battery life, professionals can stay productive on transcontinental flights or work through two full days on the go without having to recharge. This high-performance notebook can also be charged up to 50 per cent in less than 45 minutes. The new Windows 10 Pro notebooks feature up to 8th Gen Intel Core i7 processors, up to 24GB DDR4 memory, up to NVIDIA GeForce MX250 graphics and up to 1TB of responsive Gen 3 x4 PCIe SSD using NVMe technology for speeding through editing large spreadsheets and creating presentations. 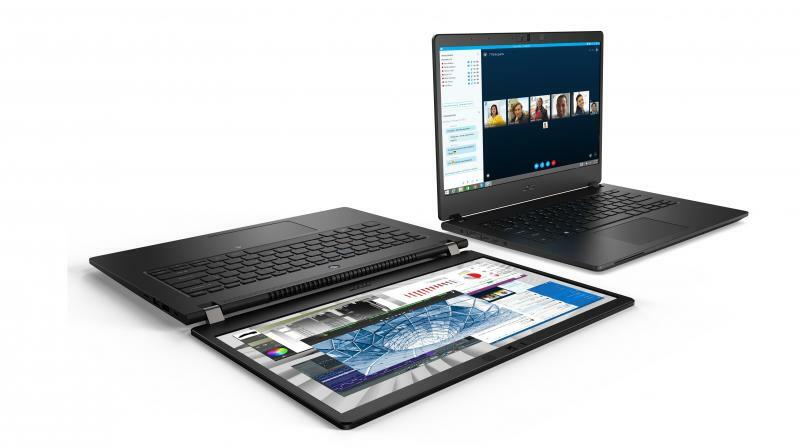 The TravelMate P614-51 makes sharing and collaborating easy with a 180-degree hinge design, enabling it to lay flat for sharing the display with others. The TravelMate P614-51’s 14-inch Full HD (1920 x 1080) IPS display delivers accurate colour with 170-degree wide viewing angles. Full-sized and back-lit, the keyboard provides comfortable typing and enables travellers to work in low-light areas, such as in airplane cabins and on trains. A damage-resistant, ultra-responsive Corning Gorilla Glass NBT touchpad enables precise gesture controls and swiping. Compared to traditional mylar, Corning Gorilla Glass is tougher, more resistant to scratches, and easier to clean. Skype for Business-certified, the TravelMate P614-51 delivers crystal-clear video conferencing via a four-mic array that picks up vocals from up to 6.5 feet away. Users can use the Cortana personal digital assistant to send voice commands for staying organised, playing music and managing the home remotely. In addition to keeping data safe, companies want devices that are easy to deploy and manage remotely. Outfitted with Windows 10 Pro, the TravelMate P614-51 offers powerful security features to safeguard data. Customers can log in using Windows Hello with the fingerprint reader via the power button, or through the IR webcam that leverages biometric facial recognition. Both methods eliminate having to remember and use a password. When the webcam isn’t in use, the camera shutter can be closed for additional security. An integrated Trusted Platform Module (TPM) 2.0 chip delivers hardware-based protection for passwords and encryption keys. The pre-loaded Acer ProShield includes a suite of security and management tools that help safeguard sensitive data, while Acer Office Management lets IT professionals deploy security policies and monitor assets from one interface. Available as an option on select models, Intel vPro tightens security with another layer of protection, while saving time and money with efficient remote management capabilities. Professionals can maintain a reliable, high-speed wireless connection with eSim-enabled 4G LTE and 802.11ac 2x2 MU-MIMO technology. Intel Thunderbolt 3 delivers blazing-fast data transfers up to 40Gbs to USB Type-C-connected devices. Customers can connect a cable from the USB 3.1 Gen 2 Type-C port to a Thunderbolt 3-enabled device and get four times the data and twice the video bandwidth of any other port type while also supplying power and support for up to 8K displays. Other ports include MicroSD card and smart card readers, and NFC (Near Field Communication) for sharing content or making mobile payments. The Acer TravelMate P614-51 will be available in North America in June, starting at USD 1,149.99 (Rs 79,552) and in EMEA in June, starting at EUR 1,249.00 (Rs 97,786).